Southside's classic first three albums, plus Jukes Live at the Bottom Line, all on two CDs and newly remastered! This treasure trove of an anthology not only includes all four albums the Asbury Jukes cut with Miami Steve Van Zandt -- including the promo-only LP Jukes Live at the Bottom Line, which Stevie also produced -- but also finally presents this seminal body of work newly remastered, by Mark Wilder at Battery Studios in New York. The Epic recordings of Southside Johnny and the Asbury Jukes, the crucial early sides that made their reputation (and featured a ton of Springsteen/E Street Band spillover), have long suffered from indifferent sound and packaging, as all reissues had been taken from the same digital masters made at the dawn of the CD era. The Fever: The Remastered Epic Recordings changes all that. All three Epic albums -- I Don't Want to Go Home, This Time It's for Real, and Hearts of Stone (plus the single version of "Havin' a Party") -- appear here in brand-new, sparkling versions remastered from the original master tapes. Jukes Live at the Bottom Line, long only available as a promo LP or a rare Japanese CD, has gotten the same remaster treatment to be part of this 2-CD, 40-track collection. 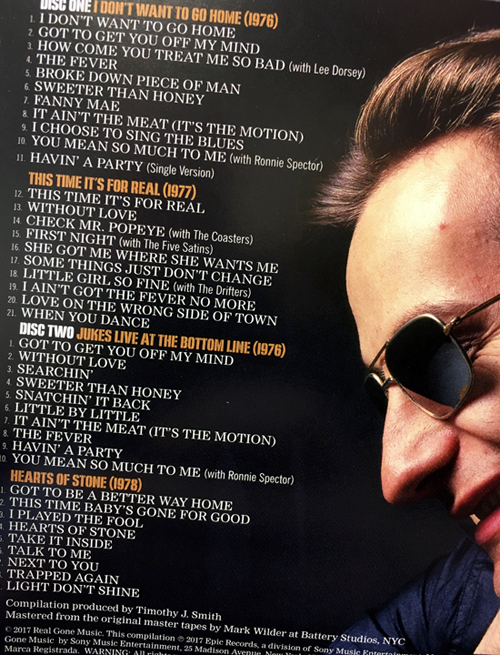 A 20-page booklet reproduces original album art (front and back), offers new liner notes by Chris Morris that feature fresh quotes from Southside Johnny himself, and reprints Bruce Springsteen's original liner notes for I Don't Want to Go Home. Speaking of Springsteen, his fingerprints are all over these projects, with such songs as "The Fever," "Little Girl So Fine," "Love on the Wrong Side of Town," "When You Dance," "Talk to Me," "Trapped Again," and "Hearts of Stone" all written or co-written by The Boss, while Miami Steve not only produced all four Epic albums but wrote much of the repertoire. But the real star here, of course, is Southside Johnny himself, one of the great white R&B singers of this or any other time, backed by a crack band including The Miami Horns and with such special guests as Ronnie Spector, The Coasters, The Drifters, and The Five Satins. Joyful, soulful music finally sounding the way it oughtta! Two CDs housed in a slim double jewel case. Licensed by Epic Records/Sony Music to Real Gone Music.